This illusion can be performed in the center of a brilliantly lighted stage, away from all curtains and drops. A board is seen resting on two decorated supports. Any spectator (or the magicians assistant) is placed on the board. The supports are removed and the board (and the person) remains suspended in mid-air! A flexible hoop is passed completely around and over the person on the board. The audience can clearly see under and above the floating subject. This is a one-man illusion, requiring no assistants. The Super-X Levitation weighs less than fifty pounds, is quickly assembled and has nothing that will wear out or go wrong. 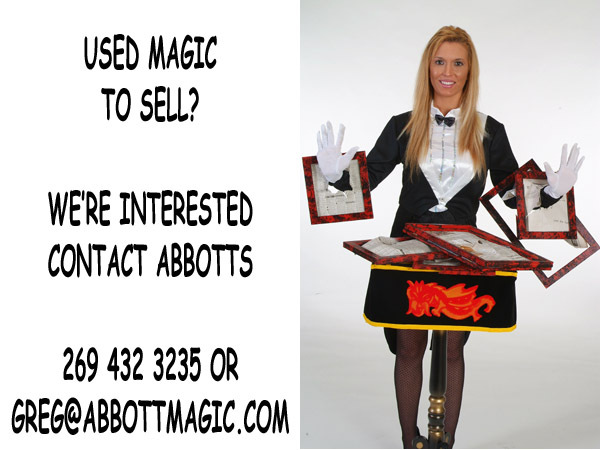 Abbotts Super-X Levitation surpasses them all for practicality and effectiveness. A proven-safe method. It can be performed anywhere: club, living room, on stage or outdoors. There is nothing attached to the performer at any time. You can work this illusion immediately.